I learned to make guacamole in 2006, on my last vacation to Lake Tahoe before I had kids. Back in the days where I could read more than a page at a time without interruption. Back when I could walk to the Starbucks up the hill with our friends, wait for coffee and actually sit to drink it. Back when I could waste too many nickels and quarters on slot machines. Back when I weighed 115 pounds. Wait…I think I weighed 115 in fifth grade. Quick, stop doing the math and look at my littlest guy. He’s practicing his game show face. Vanna has to retire someday, right? After finding a recipe for what was titled as “The World’s Best Guacamole”, I gave it my best and wound up with, yes…the world’s BEST guacamole! There was no internet back in 2006, so I couldn’t pin the recipe on Pinterest. Ok detectives, you got me, again! There was the internet in 2006. You’ve caught me in a lie. My guacamole bowl was no lie however, that was stinkin’ good. Alas, I can not find the recipe again. It was published in Sunset Magazine, which is a west coast mag.I think I’ve got the hang of guac now though, so I’m not too worried. What I have for you is a great recipe to please everyone. The guacamole isn’t spicy, but is easily made so if desired. It has little chunks of all the vegetables and THE herb that makes guac, but nothing is super noticeable. It can be played up or down and will make just about anyone happy! And if you decide to Google it, I can tell you now that it isn’t “Gabriel’s Guacamole.” Trust me, I’ve tried. Play around with the ingredients. This recipe is very basic, but offers some fun options! Mash avocados and combine remaining ingredients into medium bowl. Use a stick mixer or food processor to cream the guacamole if desired. Kids tend to prefer creamy guacamole. Boring months with a bit of chocolate and Irish beer thrown in the mix. Is that how your calendar works too? Now that we are rolling into being social again, we are going to need to talk food to share. Hopefully, you are occasionally invited to something. You seem like a nice person, why wouldn’t someone want to invite you over? And chances are if you give a mouse a cookie, you’ll need to bring something to the potluck. If you are like me, you don’t have a “go-to” dish you bring to potlucks. You aren’t known for anything special. Except your exquisite beauty! Well, search Pinterest no more! Here are your new go-to dishes, friends! AND, a new favorite around here…Artichoke Bread! But baker be warned, this is not a DAMY friendly, low-calorie dish. This is the appetizer you bring to your skinny friend, that one you are sabotaging into getting chunky. Just teasing, I would never do that to any of my friends. Remember though, most of your friends aren’t on diets and kids are down for melty cheese anyday. This makes 2 full loaves. That's 4 lengths of artichoke bread. Not intended for dieters. I just learned about Devils On Horseback. Have you heard of these before? There are different combinations, but the main ingredients seem to always be bacon and dates. 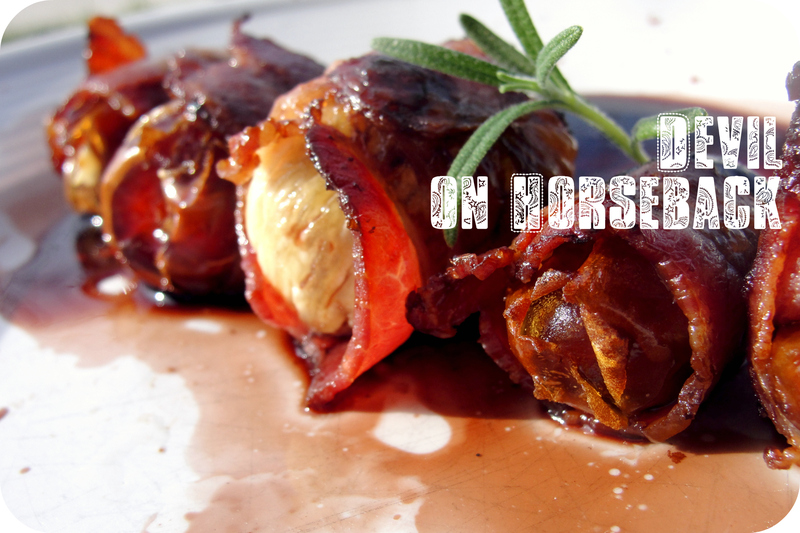 For those who don’t appreciate dates, prunes turn the appetizer into angels on horseback. Martha Stewart stuffs her dates with fancy cheese, while others opt for smoked almonds in the center of the fruit. I chose cream cheese! All you’ll need to recreate my version is some good bacon (nitrate free, please), dates (or prunes), cream cheese and a bottle of balsamic vinegar. 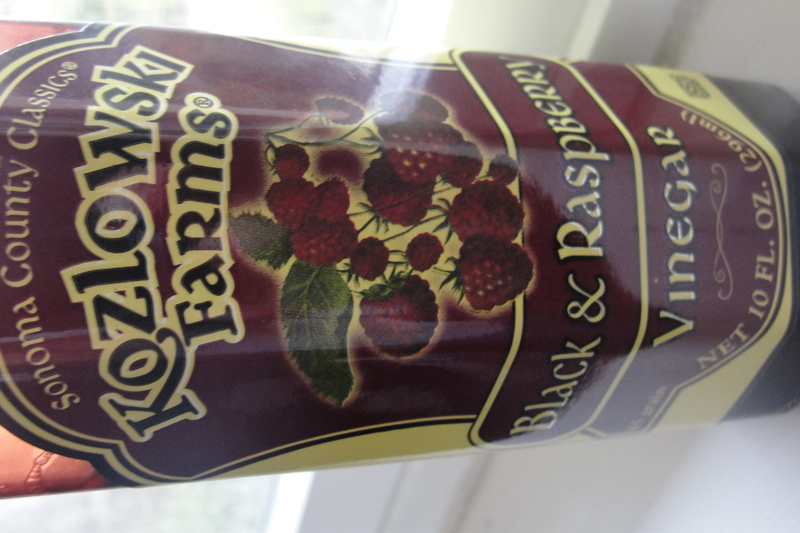 I thought I’d get a little cah-razy with my vinegar and bought a bottle of black & raspberry balsamic. Bring 1/4 – 1/3 cup balsamic vinegar to a near boil (I added 1 T. brown sugar for added sweetness). Then, lower heat and let reduce at least half way at a low temperature. Be patient, the more the vinegar reduces, the better it tastes. I had some extra figs in my fridge and decided to wrap them in bacon as well. They come out a bit sweeter than the dates and add a little brightness to the plate. Tip: My bacon looked a little too soft about half way through baking, so I gave each piece a little roll with a spoon. This helped ensure crispy bacon the whole way round, so flip ’em over if needed. When Dallas saw that I was making these he said, “Eww, mushrooms.” I promised him these ones would be different and after piling the fungi on a plate around some marinara, he agreed to be my taste tester. All of him “mmm’s” and “so goods” lured Max to his booster seat and now both of my kids are eating mushrooms to the tune of Dino Dan. We agreed that the name of the appetizer must be changed from Baked Mushrooms to something kids would like. 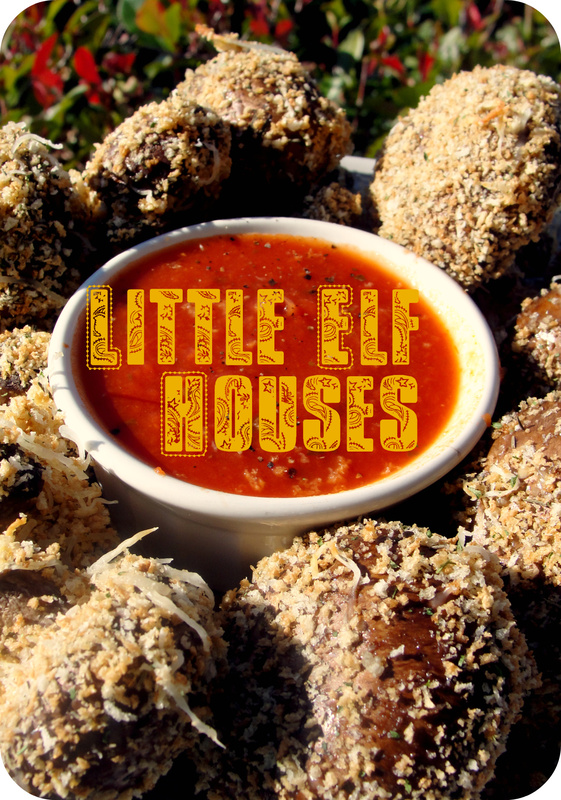 After testing out “Christmas stuff” and “Spicy Trees,” Dallas came up with “Little Elf Houses.” Perfect! These couldn’t be easier to make. They works in the same way fried chicken does. Heat your oven to 350 degrees. Whisk one or two eggs in a shallow bowl and wet the mushrooms before dipping into a mix of bread crumbs, shredded cheese and minced garlic. That’s it, that is all of it! Feel free to sprinkle the mushrooms with any crumbs left over and bake for 10 minutes. Short and sweet, right? That’s what we all need right now during this high cookie holiday season. Happy Hanukkah too who celebrate! Come back tomorrow to check out a review of the newest Sherlock Holmes and a twist on traditional fish and chips! Cake pops have had their 15 minutes of fame. Move over sugar balls, it’s time to present cheese pops! Not being from the Midwest, I may be slow to this wagon, but I am here now. I learned the recipe from Cooking Channel newcomer and former model, Lorraine Pascale. Add this quick appetizer to your recipe file. Not only are these Parmesan Pops really yummy, they are ready to eat in under ten minutes! Don’t skip out on the extras, they give texture, color and a different bit of flavor. The standard recipe uses poppy and sesame seeds. Don’t be afraid to try out new combos, including spice mixes. Toss the cheese and seeds together in a small bowl. Sit a 3½ inch ring or cookie cutter on one of the baking sheets and sprinkle a small handful of the cheese mixture into it, in a thin layer. Carefully lift the ring off to reveal a neat-edged disk of Parmesan and lay a lollipop stick on top, with the tip of the stick touching the middle of the disk. Repeat with the remaining cheese and sticks to make 10 in total (leaving about 1¼in spaces between them to allow for any spreading during cooking). You should have a little Parmesan left over, so use it to cover up the part of the lollipop stick resting on the disk. Bake in the oven for 5 minutes, swapping to a different shelf halfway through. The cheese should be lightly golden and bubbling. Remove from the oven and slide the paper off the baking sheets and onto a rack to help speed up cooling. Let cool for 1 to 2 minutes until the lollipops have become crisp. Very carefully remove each one with a spatula. Here is what I did with the major takeover of chickpeas in my kitchen! 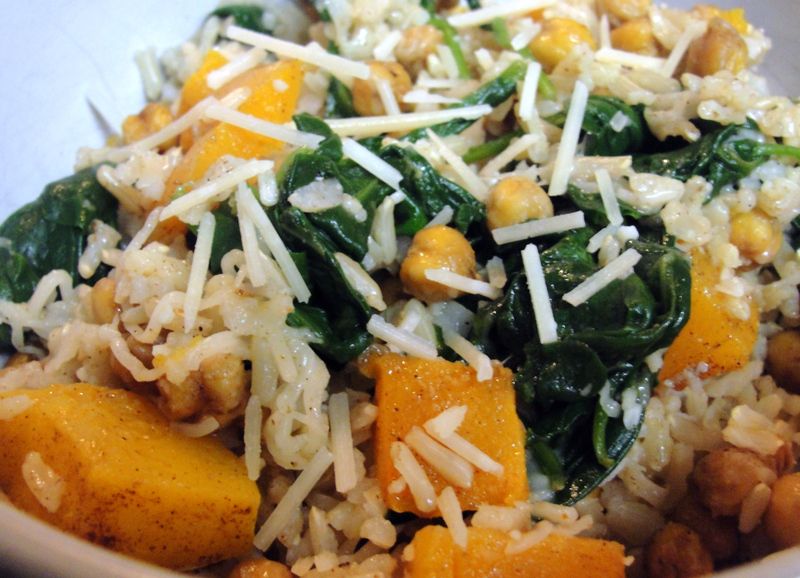 I mixed some brown basmati rice (found also at the Indian store) with some quickly wilted spinach, roasted butternut squash that had been sweetened with brown sugar and cinnamon and topped it off with parmesan and shredded mozzarella. I expected my family to veto, but they all loved it.